Liam wanted in on the pic this week! I wasn't up 4 lbs until 18 weeks with Liam, eek! However, I have to remind myself that I am still way under my pre-pregnancy weight with Liam, and that my body is just working its way towards a good healthy weight! Symptoms: Still in the throws of those 1st trimester symptoms; however, they do seem to be lessening. The nausea wasn't nearly as bad this week, although my energy still isn't back. I'm peeing about 4 hundred times a night and constantly thirsty. I'm happy to see improvement though and I am very hopeful that by next week I may be heading into the "sweet spot" of pregnancy! Gender Predictions: I've thought boy since the beginning, but just this week I had a dream that the baby is a girl. I'm now 1 and 1 on gender dreams. And this week it has just felt like a girl! We shall see! Miss Anything? My energy & just enjoying food in general. Food Cravings/Aversions: Still apples & caramel sauce and all things blueberry (I believe I was on a blueberry kick with Liam too)! I'm having an aversion to most foods, but that seems to be improving as well. Except for meat; I'm worried I'm going to have a big meat aversion again. Liam has been wanting meat (any meat) dipped in ketchup every day for a few weeks now... Preparing it and watching him eat literally makes me want to gag! Staying Active? Yep, although not quite as often as I'd like. I managed to fit in 3 workouts this week, and with Conor on a business trip for a couple of days I'm actually quite proud of this. Sometimes just spending the day with a toddler feels like a workout! Liam's Thoughts: He loves talking about the baby which makes us smile so big. He always mentions holding the baby when it's done growing. He will also tell us where the baby will sit if we are ever somewhere with an empty seat. He seems just as excited as we are! Looking Forward to: My mom (and later in the week my dad) coming to Utah for a visit!!! This will be the 1st time I have seen them since we found out I was pregnant! Such a sweet little bump! You look great! You look great, love him kissing your belly!! awww Liam is so adorable! That's awesome he is so excited, are you all gonna find out the gender? 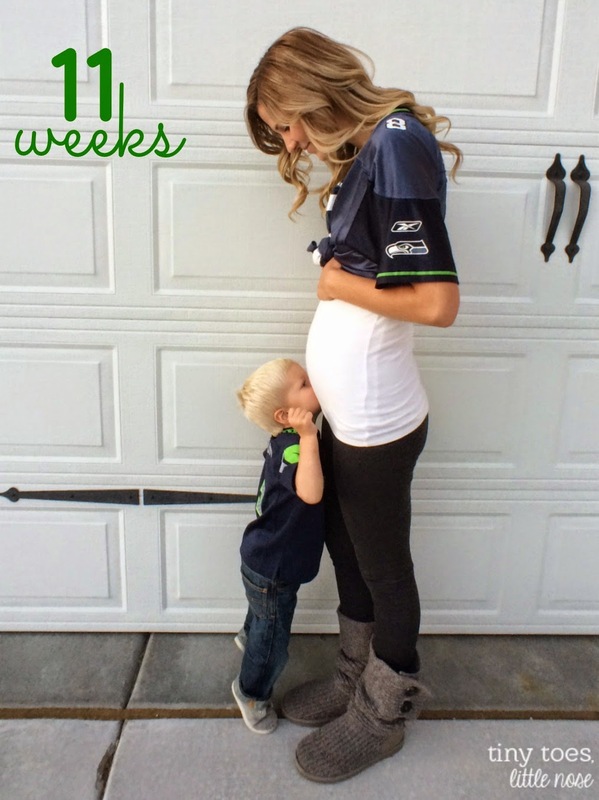 I'm stopping by from Being Mrs. Beer's blog and had to say hello :) I'm pregnant with #2, too! I totally thought this would be having a boy, but we recently found out it's a girl! Oh, babies...so fun! That picture is way too adorable :)). 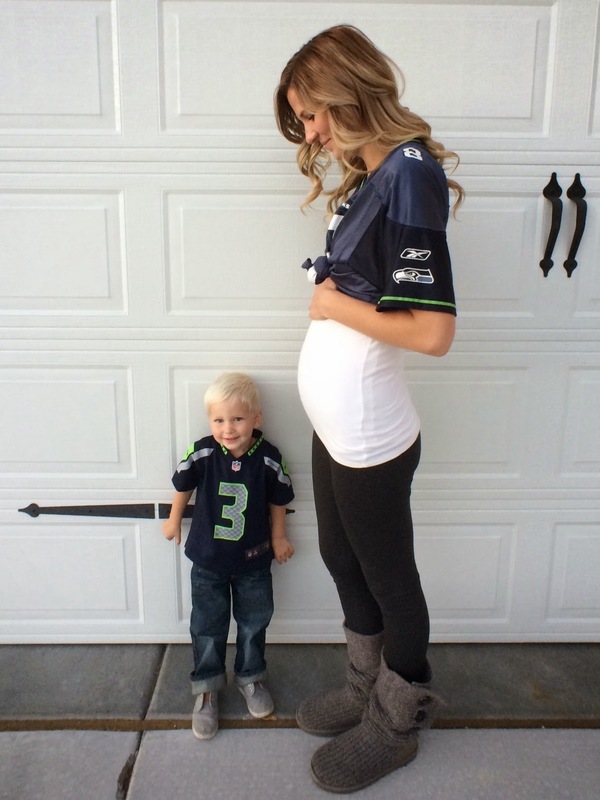 You are the cutest pregnant lady ever! So cute that Liam is just as excited! He will be a great big brother! So sweet! Liam is just adorable! That first picture... SO SWEET! I love him kissing your belly! He is going to be the best big brother! Awwwww you are sooooo precious! Love the picture of you and lil Liam!!! He will also tell us where the baby will sit if we are ever somewhere with an empty seat....that is the cutest!! Isn't it amazing how much they understand at this age about the entire concept of mommy is pregnant? I'm constantly amazed at the connections Lily has been putting together. So exciting. Aw, Liam is such a sweetheart! He's going to be a good big brother for sure. I love Parenthood! I'm really sad this is the final season, though. So sweet! Good luck! My guess is girl!